2011-01-28 Application filed by Proteus Biomedical, Inc. filed Critical Proteus Biomedical, Inc.
Sensing is carried out from locations at considerable remove from the stomach. Cooperating sensor electronics are placed at each of two wrists of the patient. The potential discomfort and inconvenience of an abdominal patch are reduced or eliminated. And alternative power sources become available. Cross-Reference to Related Application This application claims priority pursuant to 35 U.S.C. § 119 to United States application serial number 61/300,435 filed February 1, 2010, and entitled "Two-wrist data-gathering system". The foregoing is incorporated by reference in its entirety. It is not easy to know whether a patient has taken his or her medication. The assignee of the present invention has given much attention in recent years to ways of detecting ingestion of medications such as pills. Through great effort, the assignee of the present invention has devised systems involving pills each containing a device with communication means, e.g., conductive communication means, etc., and involving a receiver such as a patch applied to the skin of a patient, so that when one of the pills reaches the stomach, gastric acids activate the device which communicates a current signature. The patch picks up the current signature, thus detecting the ingestion of the pill. The patch can then pass along this event to other equipment and systems. For example the patch may use a Bluetooth protocol to send news of the event to a mobile telephone, which in turn can pass the event to other equipment. A typical patch location is the abdomen. each of which is incorporated herein by reference for all purposes as if reproduced fully within. Actual tests with real pills, real patches, and real human subjects have achieved reliable detection of communications from such pills. This is remarkable given prior-art failures to achieve such reliable detection, and the many ways in which nature, human physiology, and materials science conspire to make these results difficult to achieve. As a general matter, conventional electromagnetic radiation is emitted by a dipole and detected and received by a dipole, and conventional models assume that the signal strength falls away with distance at a rate determined by the permittivity and permeability of the medium (here, human tissue). Many investigators in this general area thus proceed with the assumption that the receiver, such as a patch, needs to be as nearby as possible to the transmitter (that is, nearby to the stomach). Fig. 1 shows a patient 101 with a wristwatch 102 and a bracelet 103 according to an aspect of the invention. Wristwatch 102 is on right wrist 105 and bracelet 103 is on left wrist 106. (It will be appreciated that this left-right arrangement is quite arbitrary and one could exchange the positions of the wristwatch and bracelet without departing from the invention.) One of the chief goals is to detect a transmitted signal or communication from pill 104 when it is triggered by gastric juices. It will be appreciated that while this invention is described in an exemplary aspect where stomach juices trigger the pill, other variants could be devised such as aspects where the triggering does not occur until the pill reaches, say, the small intestine. One could also devise a staged approach where a first signal is triggered at a first point of progress through the gastro-intestinal system and a second signal is triggered at a second point of progress. Turning now to Fig. 2, we see an exemplary wristwatch 102 with elastic band 203. The elastic band helps to keep the electrode 202 in intimate contact with skin of the patient. A display 204, such as an LCD, is shown. A pushbutton 205 is also shown. In this way a man-machine interface (MMI) is provided. It will be appreciated, of course, that the MMI need not be limited to what is shown here. Other elements of an MMI, such as a piezo beeper or other sound source, could be provided. A touch screen or other human input device (HID) could be used. The LCD and pushbutton are merely exemplary. While this aspect is described with respect to elastic wristbands, other approaches such as a Speidel twist-o-flex® watchband could be employed to keep each skin electrode in intimate contact with the skin. Fig. 3 shows the bracelet 103 with elastic band 203. The elastic band keeps electrode 302 in intimate contact with skin of the patient. In the examplary arrangements that follow, the electrodes 202, 302 will be described as electrodes in intimate (conductive) contact with skin. Perhaps less preferred, but also workable, would be electrodes 202, 302 in capacitive coupling with skin, that is, with some dielectric such as plastic film therebetween. Perhaps even less preferred, but maybe also workable, would be an arrangement in which the wristband 203 is not elastic at all but is of constant circumference, permitting the electrodes 202, 302 to be in a spaced relationship relative to skin, sometimes having an air gap or partial air gap therebetween. Fig. 4 shows the wristwatch 102 in cross section, with electrode 202 in intimate juxtaposition with wrist 105, and with chip 401. Chip 401 is communicatively coupled, preferably metallically connected, with skin electrode 202 and with a second electrode 402. The second electrode 402 is open to the air, and provides what might be modeled as a counterpoise for the skin electrode 202. A nonconductive casing 403 provides structure between the two electrodes. Fig. 5 shows the bracelet 103 in cross section, with electrode 302 in intimate juxtaposition with wrist 106, and with chip 501 in communicative coupling with skin electrode 302 and second electrode 502. The bracelet electrodes together with housing or casing 503 function similarly to their counterparts in the wristwatch. Fig. 6 shows wristwatch chip 401 in functional block diagram form. Previously mentioned electrodes 202, 402 may be seen, communicatively coupled with transceiver 605. Cell 603 and power circuitry 604 provide power to transceiver 605 and to controller 606. Controller 606 controls transceiver 605 and provides MMI such as LCD 204 and pushbutton 205, and optionally other MMI such as a piezo beeper or other sound emitter. LCD 204 is controlled by multiline bus 607. Interestingly, a technology that seems rather old-fashioned, the self-winding mechanical watch, offers possible benefits here. As shown in Fig. 6, a pendulum 601 has an opportunity to move around as the human user moves around. A strong permanent magnet in the pendulum induces currents in a winding or windings 602. This permits the cell 603 to be a rechargeable cell, or perhaps an ultracapacitor, mediated by power circuitry 604. Bluetooth or other protocol system(s) 607 can communicate with external equipment such as a cell phone or personal computer. Fig. 7 shows bracelet chip 501 in functional block diagram form. The elements shown there correspond closely with elements in Fig. 6. The day-to-day function of the system (the pills, the bracelet, the wristwatch, and other equipment such as a mobile phone) will now be described in an exemplary aspect. A chief goal is to detect, at the bracelet 103 and wristwatch 102, a signal from a pill. To this end, the bracelet may carry out a real-time nearly continuous detection of signals at the skin electrode 302 relative to counterpoise 502. This detection is A-to-D (analog-to-digital) converted, e.g., by an ADC (not shown in Fig. 7), preferable at a resolution higher than 16 bits, and the measured signal (communicated digitally and preferably as compressed data) is communicated via a wireless link to the wristwatch 102. The wristwatch likewise carries out a real-time nearly continuous detection of signals at the skin electrode 202 relative to counterpoise 402. This detection is A-to-D (analog-to- digital) converted, preferable at a resolution higher than 16 bits. The data streams from the two sensors (one at the bracelet, one at the wristwatch) are then communicated externally to other equipment that can do signal processing and can detect signals of interest such as the signal from the pill when it is triggered. In a preferred arrangement, all of the noise would be common-mode and the signals of interest would be differential signals measured at the two arms. As mentioned above, it is rather counterintuitive to take the step of moving the sensors to points that are about as far from the pill 104 as can be imagined. Once the counterintuitive nature of this move is accepted and put out of mind, many other interesting capabilities become available that would likely not have been available at all in prior-art arrangements such as an abdominal patch. 10.1109/BIOCAS.2007.4463332, incorporated herein by reference. Sensing things from further away from the body is discussed in PCT publication WO 2009/055733 entitled "Fluid transfer port information system", incorporated herein by reference, and in US published application US 2009-0112178 Al with the same title, likewise incorporated herein by reference. 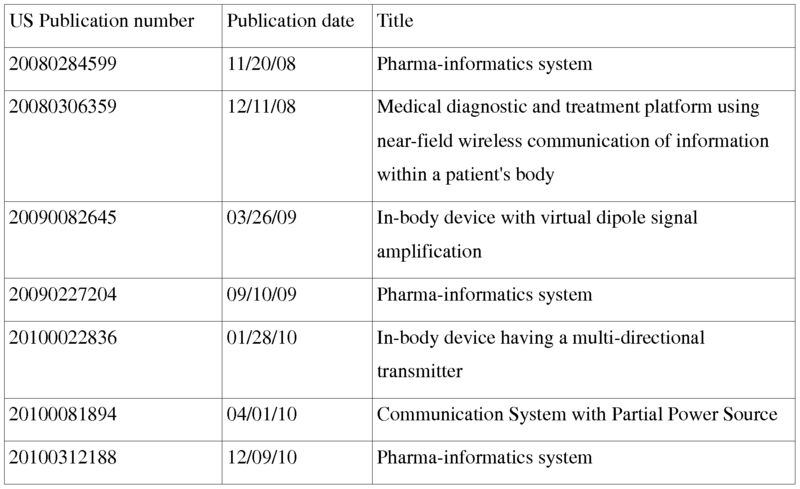 Sensing blood volume is discussed in US patent application number 61/160,265 filed March 13, 2009 and entitled "Volume-sensing device, system, and method", incorporated herein by reference. Other related technology is discussed in US patent application number 61/240,571 filed September 8, 2009 and entitled "Body-associated device", incorporated herein by reference. As one potential benefit mentioned above, the move to the wrists permits the provision of a workable MMI. Wrists also tend to move around more than abdomens, making the self-winding feature more likely to serve its purpose. More subtle and interesting capabilities, however, present themselves once the stimulus/sensing platform of a bracelet and wristwatch are available. The heart function (essentially a two-electrode EKG) can be measured. Energy can be transmitted at one of the two points (for example at the bracelet) at some frequency, which propagates through the body to the other point (in this example at the wristwatch) with some measured delay and some measured level of absorption, or measured impedance. Separately, energy can be transmitted at one of the two points (again for example at the bracelet) at a different frequency, which propagates through the body to the other point (again in this example at the wristwatch) with a non-identical measured delay and a non-identical measured level of absorption, or measured impedance. This probing of the body amounts to spectroscopy, and permits measuring bodily qualities such as amount of fluid in the body relative to other tissue materials. In this way, blood volume can be indirectly measured. Real-time measurement of blood volume has rarely if ever been achieved except by keeping a patient stationary during measurements, with large, bulky, and stationary measuring equipment. This approach permits real-time measurement even as a patient is ambulatory. These measurements may permit real-time measurement of cardiac output or stroke volume at the heart. It will be appreciated that one of the important parts of analysis of data collected at electrodes 202, 302 (at the bracelet and at the watchband) is the time-correlation of measured data. One might think that this requires a highly accurate clock running in each of the bracelet and watchband, the two clocks being extremely closely synchronized. But in fact it is quite workable to allow the two clocks to be less expensive (and less power-hungry) clocks that are permitted to drift relative to each other. At the wristwatch, synchronization events (simultaneous detection of common-mode impulse signals from the environment, for example) permit receiving a time signal from the bracelet which will then be understood to match a time value at the wristwatch. Drift of one clock relative to the other can be detected and corrected in this way. The wristwatch and bracelet can be stylish. They need not look "clunky". The patient might actually enjoy wearing a recognizable or distinctive wristwatch and bracelet. The A-to-D conversions at the two sensing locations are likely 18-bit, but might be sixteen-bit or twelve-bit. Communication from the bracelet to the wristwatch might be open-loop (one way from bracelet to watchband) but it is thought preferable that the communication be bidirectional, at least to provide handshaking. The communication may use an inductive coupling through the body at a high-frequency RF signal (higher than the sensed information that is expected to be in the range of 0.1 Hz to perhaps 100 Hz). Alternatively the communication can be optical infrared (bouncing off the surrounding walls and structures). The MMI might provide a reminder to take a particular pill. And the MMI might provide an audible or visual acknowledgment when the patient has taken a particular pill. Accelerometers in the bracelet or watchband or both will permit measurement of a physical activity level, and may permit detecting times of sleep. These could likewise be reported external to the patient. The allocation of computational resources can be varied somewhat. For example it may be workable to do most of the computations in the wristwatch, comparing the signals as measured at the bracelet and at the wristwatch. Alternatively it is workable to do the computations elsewhere (e.g. at a distant computer) and to have the wristwatch simply pass along the information which it received from the bracelet. The needed bandwidth from bracelet to wristwatch, and from wristwatch to distant equipment, is such at a carrier of 10 MHz should be adequate. The alert reader will have no difficulty devising myriad obvious improvements and variants of the invention, all of which are intended to be encompassed by the claims which follow. 1. A data gathering method carried out with respect to a first device and a second device, each of the first device and the second device comprising a respective electrical signal detector having respective first and second electrodes, the method comprising the steps of: placing a first device upon a first limb of a living body, the first device encircling said first limb, the first electrode of the first device juxtaposed with said first limb, the second electrode of the first device more distant from the first limb than the first electrode; placing a second device upon a second limb of a body, the second device encircling said second limb, the second limb being a limb other than the first limb, the first electrode of the first device juxtaposed with said second limb, the second electrode of the second device more distant from the second limb than the first electrode; at the first device, measuring electrical signals at the respective signal detector differentially between the respective first and second electrodes, yielding a first data stream indicative thereof; at the second device, measuring electrical signals at the respective signal detector differentially between the respective first and second electrodes, yielding a second data stream indicative thereof; and analyzing the first data stream and the second data stream together, thereby deriving information of interest about the body. 2. The method of claim 1 wherein the analyzing step further comprises synchronizing the first data stream to the second data stream by aligning common-mode events therein. 3. The method of claim 1 wherein the analyzing step is carried out at equipment separate from the first device and separate from the second device, the method further comprising the steps of: communicating the first data stream from the first device to the equipment, and communicating the second data stream from the second device to the equipment. 5 comprises encircling a wrist of the second limb. 5. The method of claim 1 wherein the analyzing step comprises detecting at least one of a signal and a communication associated with an ingestible device ingested by the body. \%. The method of claim 1 wherein the first device has a rechargeable energy storage, the method further comprising the step of moving the first limb, and converting movement of the first limb into electrical energy, said electrical energy recharging the rechargeable energy storage. 7. The method of claim 1 wherein the measuring of electrical signals at the first device comprises 15 carrying out an analog-to-digital conversion, the first data stream being digital, and wherein the measuring of electrical signals at the second device comprises carrying out an analog-to-digital conversion, the second data stream being digital. 8. The method of claim 7 wherein the analog-to-digital conversions take place with a resolution of 20 at least sixteen bits. 9. The method of claim 1 wherein the analyzing step comprises carrying out an electrocardiogram measurement with respect to a heart of the body. emitting second electrical energy within a second band at the first device, the second band different from the first band; detecting the second electrical energy at the second device; and comparing the detected first electrical energy and the detected second energy with each other, thereby deriving information of interest about the body. 11. The method of claim 10 wherein the step of deriving information of interest about the body comprises inferring a ratio of fluid to non- fluid within the body. 12. The method of claim 10 wherein the step of deriving information of interest about the body comprises inferring blood volume within the body. 13. The method of claim 6 further comprising the steps of: inferring a level of physical activity of the body from the converted electrical energy, and communicating the inferred level of physical activity external to the first device and external to the second device. 14. The method of claim 1 further comprising the step of: communicating the first data stream from the first device to the second device; wherein the analyzing step is carried out within the second device. 15. The method of claim 14 wherein the communicating step is carried out by means of infrared light communications or by means of high frequency radio frequency communications. 16. A system comprising a first device and a second device, the first device comprising a respective electrical signal detector having respective first and second electrodes; the second device comprising a respective electrical signal detector having respective first and second electrodes; the first device shaped for encircling a limb of a subject, the first electrode of the first device disposed to be juxtaposed with said limb when the first device encircles the limb, the second electrode of the first device disposed to be more distant from the limb than the first electrode when the first device encircles the limb; the second device shaped for encircling a limb of a subject, the first electrode of the second device disposed to be juxtaposed with said limb when the second device encircles the limb, the second electrode of the second device disposed to be more distant from the limb than the first electrode when the second device encircles the limb; the electrical signal detector of the first device responsive to signals at the respective first and second electrodes, yielding a first data stream indicative of a difference between the signals at the respective first and second electrodes; the electrical signal detector of the second device responsive to signals at the respective first and second electrodes, yielding a second data stream indicative of a difference between the signals at the respective first and second electrodes; the system further comprising an analysis means, said means responsive to the first data stream and the second data stream, for deriving information of interest about the body. 17. The system of claim 16 where the analysis means is separate from the first device and separate from the second device, the system further comprising: a communications link from the first device to an? equipment, and a communications link from the second device to the equipment. 18. The system of claim 16 wherein the first device further comprises a rechargeable energy storage, the first device further comprising a means converting movement into electrical energy, said electrical energy recharging the rechargeable energy storage. 19. The system of claim 16 wherein the first device further comprises an analog-to-digital converter converting analog signals from the respective first and second electrodes into digital data, the first data stream comprising said digital data. 20. The system of claim 19 wherein the analog-to-digital converter has a resolution of at least sixteen bits. 21. The system of claim 16 wherein the first device comprises an emitter controllably emitting first electrical energy within a first band at the first device and controllably emitting second electrical energy within a second band at the first device, the second band different from the first band; and wherein the second device comprises a detector disposed to detect first electrical energy and the second electrical energy; the analysis means disposed to compare the detected first electrical energy and the detected second energy with each other, thereby deriving information of interest. 22. The system of claim 18, wherein the analysis means infers a level of physical activity of the body from the converted electrical energy, and communicates the inferred level of physical activity external to the first device and external to the second device. 23. The system of claim 16 wherein the first device communicates the first data stream to the second device; and wherein the analyzing means is within the second device. 24. The system of claim 23 wherein communicating is carried out by means of an infrared light communications channel or by means of a high frequency radio frequency communications channel.